Kerry tops for Tourism with sweep of prestigious awards. Front Row, L-R: Moira Murrell, Chief Executive Kerry County Council, Cllr Norma Foley, Cathaoirleach, Kerry County Council, Niamh O’Shea, Chairperson, Kerry Irish Hotels Federation. Standing (Representing the following Hotels and Guest Houses in County Kerry) L-R: Mark Sullivan – The Rose Hotel, Anne Marie Collins – International Killarney, Donal Liston – Ballybunion Community Forum, Siobhan Ní Mathúna – The Meadowlands, Maurice O’Donoghue – The Brehon, Emer Corridon – Cahernane House, Thys Vogels – Ballygarry House Hotel, Heather Mac Iver – The Meadowlands, Helen Woods Heaton and Brian Heaton – Castlewood House, Sheila O’Callaghan – The Lake Hotel, Ruth O’Sullivan – Manor West Hotel, Padraig McGillicuddy – Ballygarry House Hotel, Joan McCarthy – Head of Tourism, Kerry County Council. Just one of the many comments from Irish Independent readers who voted Kerry as their No. 1 Home Holiday Destination in its 2019 Reader Travel Awards. 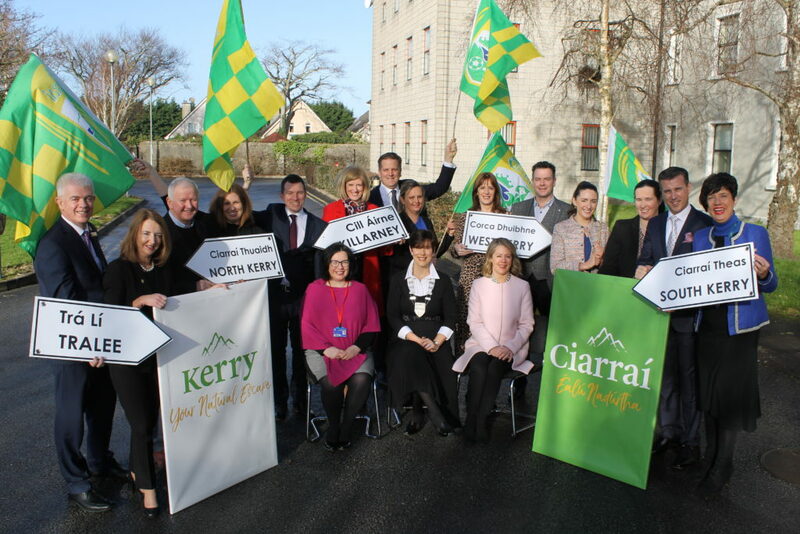 Kerry has been picking up a number of prestigious tourism awards throughout the month of January with several hotels and guesthouses across the county also coming tops in various awards including Trip Advisor Travellers’ Choice Awards 2019. County Kerry was also represented at the finals of the Irish Tourism Industry Federation Awards. These awards give recognition to and promote people, companies and organisations – overseas and at home – that have made significant contributions to developing, marketing, selling and delivering improved visitor experiences in Ireland and to increasing the number of visitors from overseas. Kerry County Council was a finalist in the Best International Marketing Initiative category. Parknasilla Resort & Spa was a finalist in the Best Wild Atlantic Way Tourism Experience category, and the overall winner of The Best Innovative Place to Stay went to The Gleneagle Group for their Accessibility Strategy. “These awards are all the more special because readers voted with their feet, literally. Our beautiful and amazing county is where they chose to spend their holidays and the destination they would recommend to a friend,” said Cathaoirleach of Kerry County Council, Cllr Norma Foley. “These awards are testament to the wonderful work being done by everybody in the industry to promote what Kerry has to offer to visitors and has focussed the spotlight on Kerry as a premier tourist destination,” she said.